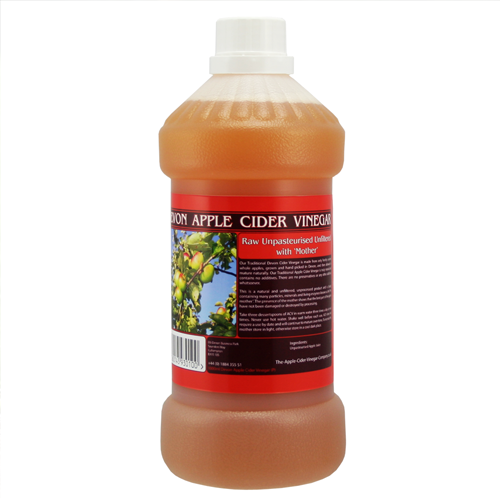 Our apple cider vinegar is now supplied in phalate free HDPE bottles which will not leech chemical agents into your vinegar. Our quality Devonshire natural apple cider vinegar. Unfiltered, unpasteurised and with the 'mother' intact. 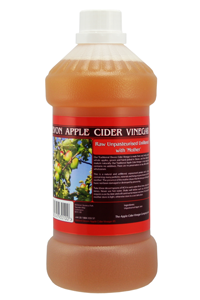 "It took me a long time to find unrefined, proper apple cider vinegar this good. I have consumed 2 bottles and I know it is beneficial. I highly recommend it. Thank you for supplying it and for your efficient service ! " "what a differance in taste when it is the real stuff,i bought some from supermarket and it was yuk. Highly recommend this sight ,it tastes good and came very well packaged and very quickly .I will be back for more." "I've been using this everyday now for all manner of ailments both internally and externally and it has yet to fail me since I bought my first bottle half a year ago. Not only is it cheap but the quality is the best I have found compared to the 'vinegar' you can buy in the supermarket. I thoroughly recommend this product to everyone. "What a delightful product this is. Used by myself daily in all cold drinks & water AND by my doggies too. 1 has eczema & the other arthitis, & since starting to add a capful to their meals & water, both have improved beyond belief. My elderly terrier suffered awfully on his strong medication & had to have supplements to protect his damaged liver as a result. Since changing him to raw diet then adding Devon apple cider vinegar, he's stopped having problems & has a new lease of life without drugs. My young dog's skin is so much better & I add a cap to a cooled water spray to reduce any itchiness & hotspots.. It's been an absolute blessing this hot summer! The taste is divine and the quality beats anything else on the market....Thank you so much from us all." "Best apple cider vinegar available anywhere, simplez. Have not tried the vintage, but logic dictates that it will be even better."